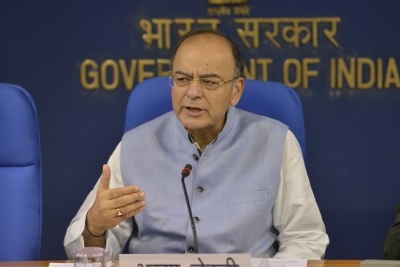 New Delhi July 13 (IANS) Union Minister Arun Jaitley on Friday accused the Congress of only giving slogans to the poor and said Prime Minister Narendra Modi had given them resources which will ensure faster growth and faster depletion of poverty. In an article on the BJP s website Jaitley said Modi had shaken the traditional thinking process and ensured that rural India and the less privileged get the first right on resources. He said the investment by the government will this year provide rural India with 321 crore person days of employment 3.17 lakh km of rural roads 51 lakh rural homes 1.88 crore toilets and 1.75 crore of new electricity connected households. The Minister said that if increased expenditure continued for the next decade the impact on India s rural poor would be very significant. "The Congress provided India s poor with slogan. Modi has given them resources." He said the Modi government won t follow the Congress model of 1970s and 1980s for reduction of poverty. "That model essentially involved populist slogans rather than sound policy and actual expenditure for the poor." Jaitley said the `Garibi Hatao model of Indira Gandhi was about redistribution of poverty rather than generation of wealth and resources and did not lead to significant improvement in the lives of the poor. Jaitley said Modi announces stiff targets and programmes which at first sight appear to be difficult if not impossible. He follows it up with the actual implementation and delivers the promise. He said Rs 14.34 lakh crore will be spent this year for livelihood and infrastructure in rural areas and there will be additional expenditure on social sector. Referring to measures for farmers he said Rs 11 lakh crore of agricultural credit will be disbursed MSP for 14 Kharif crops will be at 150 per cent of the cost of production and Rs 10 881 crore has been approved for dairy infrastructure development fund. The minister said the government had created a micro irrigation fund with a corpus of Rs 5 000 crore and long-term irrigation fund with an initial corpus of Rs 20 000 crore. He said Rs 28 000 crore had been allocated to rural infrastructure development fund Rs 5 020 crore to animal husbandry development infrastructure fund and Rs 160 000 had been sanctioned for low-cost food under the Right to Food programme.